When I used to live in Brooklyn there was a great farmer’s market in my neighborhood on Saturday mornings. I would get up early, hit the gym, and on the walk home pop into the market and pick up fresh produce and flowers. There was also a family stand there that sold fresh caught fish which used to intimidate the heck out of me until I realized that fish is the easiest thing on earth to cook. I found one stellar flounder recipe that I would make frequently back then and had completely forgotten about it until I found myself with tilapia in my freezer leftover from my fish taco experiment. Tilapia is a white fish just like flounder so I figured it would work and it sure did. Prep time takes all of 4 minutes and the fish only needs to bake for about 7 minutes and voila, there you have it. Dinner in under 15 minutes. Way better than takeout! Arrange fillets in a ceramic or other baking dish just large enough to hold them in one layer. In a small bowl combine the garlic, lemon juice, soy sauce, sugar, and salt. Whisk in oil until emulsified and pour vinaigrette over fish. 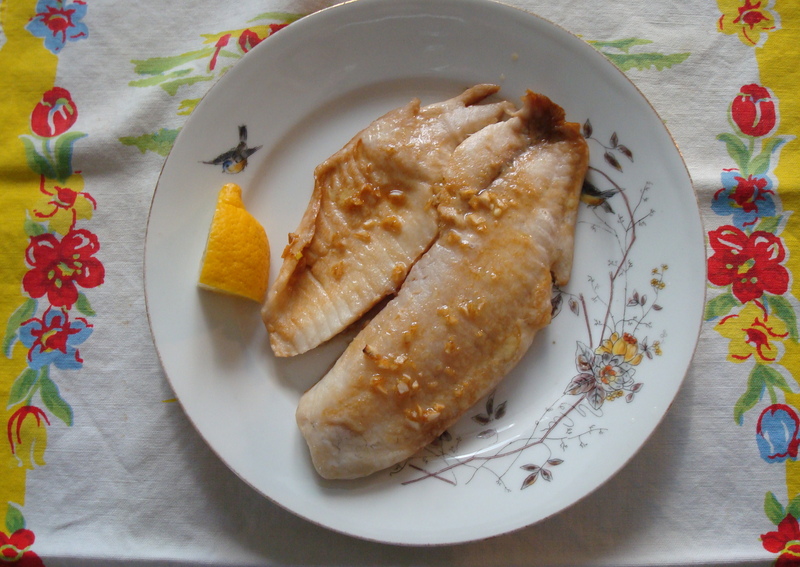 Bake fish in middle of oven until just cooked through and no longer translucent, 5 to 7 minutes. Arielle just made tilapia a few days ago. I will have to pass this recipe on to her. Thanks Kj! Looks great! Do you think it would be a disaster to let them sit in this vinaigrette overnight? Think it would “cook” them? According to something I read on Yahoo Answers, yes the vinegar would cook the fish overnight an you’d have yourself some tangy ceviche. Could have tried that when you were without an oven for so long!